You are here: Home » MEDIA » Games » Volcanoids: are you a manic (steampunk) miner? (game trailer). 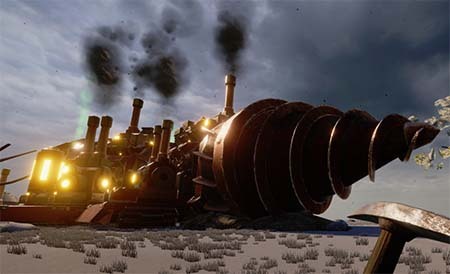 Here’s an interesting looking steampunk game – Volcanoids, where you play a pilot of a drill-ship (think the mole-tanks from Stephen Hunt’s Jackelian novels). You have to explore and mine your way to glory on a mysterious island run by some nutter with an army of killer steammen robots. The drill-ship itself looks very nice with lots of equipment inside you can operate – and, as your base, you can order it to drill across to different areas on the island when you kill off all the enemies in your local neighbourhood. Volcanoids is a first-person, base building survival game set in the steampunk era where humans and technology meet. Explore a volcanic island, operating giant drills and enduring eruptions triggered by a mechanical race of beings. It’s coming, perhaps appropriately, to the Steam platform in January 2019! Steam Garden 8, the Tokyo Steampunk Festival. « Three new anime are coming to Netflix: Cagaster of an Insect Cage, Yasuke, and Trese.